AT&T worker speak out at press conference about the horrible working conditions in call centers serving DIRECTV and Cricket customers. AT&T workers and CWA representatives are meeting with call center vendor employees this week in the Dominican Republic to learn more about what has happened to the jobs AT&T has shipped overseas and the anti-union backlash facing Dominican workers who attempt to improve conditions. The delegation includes Mimi Mahdi, a customer service representative in a DIRECTV call center in Denver, CO; Monica Gutierrez, a retail sales representative at Cricket Wireless in Fresno, CA; and Kayla Swann, a customer service representative in a DIRECTV call center in Huntington, WVA. In addition to meeting with their overseas colleagues, they are leafletting outside call centers and meeting with government officials. 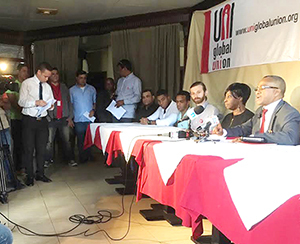 In the Dominican Republic, workers at AT&T's vendor centers are have faced severe retaliation for advocating for their right to form a union. While Dominican labor law protects workers' rights, the government does not adequately enforce these laws. At Alorica, a vender that serves DIRECTV customers, the base wage is equivalent to $2.13 per hour for Spanish-language service and $2.77 for English-language. Incentive pay is generally out of reach because of the unrealistic metrics required, and workers report docked pay and abusive management. Last April, workers formed a union to advocate for better conditions. Management responded by firing or suspending workers involved, threatening to put union activists on a black list that would prevent them from getting jobs at any call center, interrogating employees about who was involved in the union, forming a company-controlled "union" led by managers, and using other forms of harassment and intimidation. At another contractor, Teleperformance, which serves AT&T's prepaid Cricket customers, the base wage is equivalent to $2.77 per hour, with incentive pay mostly out of reach. Workers on the Cricket account have received no raises since the account started, around 2012. Since forming a union in June of 2016, they have faced an intense anti-union campaign from management, including ongoing attempts to deregister the union through the courts, firing of union leaders, threats of black listing, a prohibition on employees making pro-union comments, false accusations of fraud against workers involved in the union, and other forms of intimidation. Union leaders have faced intense harassment from management and some have been forced to quit. The CWA delegation and Dominican Republic workers shared workplace issues and committed to continuing to support each other.